Central European mountains are covered predominantly by forests. Norway spruce is the most frequently-occurring species and the most affected one. Windstorms and subsequent insect outbreaks are two main disturbances which influence the structure, composition, species richness, and land cover changes in general. 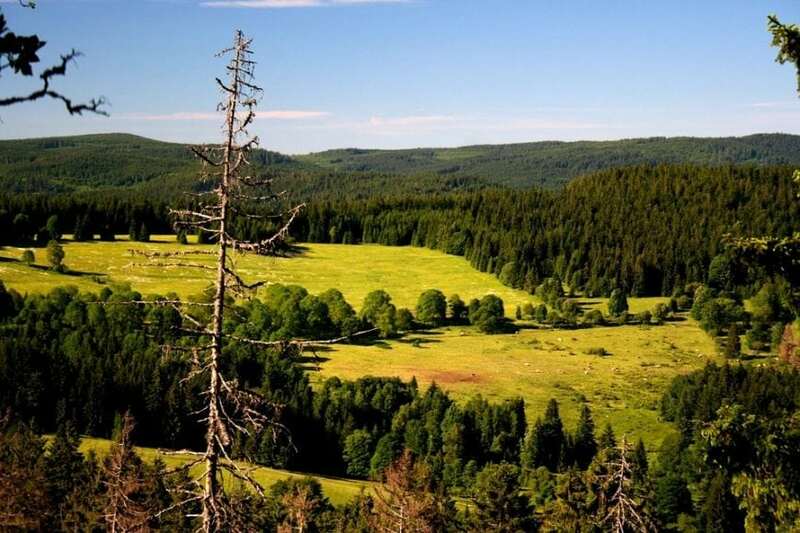 The Šumava National Park (NP) is the biggest one in Czechia. It is situated in the southwestern part of Czechia. The landscape of the central part of Šumava consists of a mosaic of flat forested ridges and a mountain plateau with peat bogs and meadows. Together with Bavarian Forest NP in Germany, they form one of the largest protected forested areas in Central Europe. During the communism (1948 – 1989) Czech part was protected by a military regime and area was protected from human intervention. After the collapse of communism, the NP was founded in 1991 on 680 km2. Windstorm Kyrill affected the area in January 2007. The event started dynamic land cover changes between the years of 2006 and 2012. Scientists used detailed airborne data to analyze and quantify the land cover changes. In the beginning, the Kyrill windstorm had a relatively small impact — windfalls increased by 4.73 km2 (0.69% of the Šumava NP) in 2007. But during the whole period, the coniferous forest decreased its proportion from 56.55% to 48.27% (between 2006 and 2012). This is a dominant process throughout the period. What happened? A new dead-standing forest originated from 2008 in the neighborhood of windfalls from the Kyrill windstorm. Between 2008 and 2009, coniferous forest lost 12.43 km2, and 10.03 km2 of the new dead-standing forest was detected. This represents the vast majority of changes in non-intervention areas of NP, where the coniferous forest was changed to a dead-standing forest. Bark beetle infestation caused new dead-standing forest and especially during infestation period (2008 – 2011) patches were spatially clusters. More than 80% of new stands were within 100m distance from dead-standing forest from previous years. However, in management intervention zones new clear-cuts and clear-cuts with dead wood increased their proportion. Between years 2011 and 2012 all processes slowed down and regeneration of forest started. To sum up, 56.71 km2 of coniferous forest was changed. The Kyrill windstorm sparked changes, and windfalls served as a source for bark beetle infestation. The bark beetle outbreak started in 2008 and created 34.23 km2 of new dead-standing forest. On the other hand, logging and creating of new clear-cuts (21.23 km2) and clear-cuts with dead wood (13.07 km2) reacted to that. Both human and natural disturbances affected almost the same proportion of area, but there is a big difference between changes in intervention zones (new clear-cuts) and non-intervention zones (new dead-standing forest). Moreover, the results of other studies suggest that regeneration is more successful in dead-standing forests and non-intervention zones. Despite this, since the beginning, NP bark beetle infestations have been managed by human intervention, which is still legal in the NP. Furthermore, fragmentation and different management of intervention and non-intervention zone do not allow natural processes on the bigger scale. These findings are described in the article entitled Recent land cover change after the Kyrill windstorm in the Šumava NP, recently published in the journal Applied Geography. This work was conducted by Tomáš Janík and Dušan Romportl from Charles University. Tomáš Janík is a Ph.D. Student at Charles University in Prague in the Department of Physical Geography and Geoecology. His research areas are sustainable development environmental analysis, city planning, and land-use planning.